Once Upon A Time, They Made Fantasy Movies Like This. Jack The Giant Slayer, Reviewed. 1. It's sort of amazing how low the bar has fallen for big tentpole action/fantasy films. With the rise of 3-D (and, more to the point, 3-D surcharges), spectacle is the minimum entrance requirement, and even that has been watered down to the point of monotony. You can pick your poison, but I've always thought the worst of these were the Clash of the Titans movies, so dim, so ugly, so lazy, so lacking in the basic foundation of story structure and any sense of awe or wonder. They're basically cheap sets, bored actors, and a final half-hour of murky, haphazard CGI. You can make these so inexpensively now, with so little effort. It's creeping Worthingtonism. 2. Which is why, grading on this steep curve, Jack the Giant Slayer is such an unexpected pleasure. 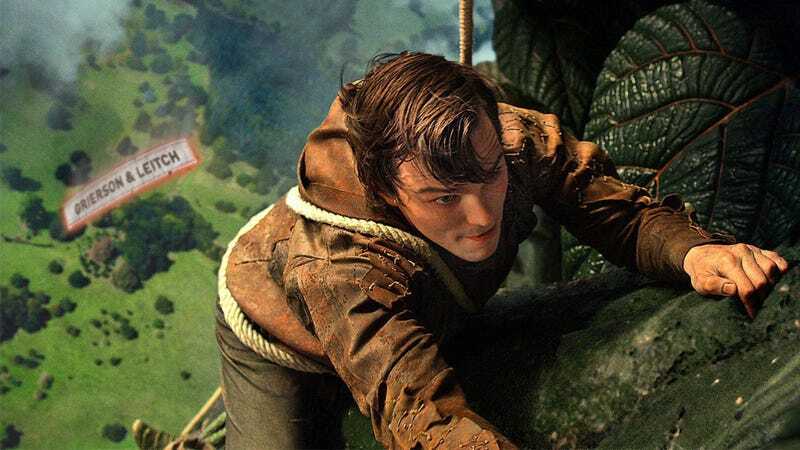 It's a determinedly old-fashioned, elegantly paced retelling of the "Jack and the Beanstalk" tale, and it's a relief to see the film not try to be something different than what it is. There's no forced modern additions, no silly comic relief, no attempt to be some revisionist "hip" retelling of an ancient tale. It simply tries to imagine the tale of Jack and his beanstalk writ large, but filtered through the imagination of the children who read it and have it read to them. It, quite simply, tells a story. What a relief. 3. Next to bozo junk-peddlers like Jonathan Liebesman and Louis Leterrier, director Bryan Singer (the X-Men franchise before Brett Ratner ruined it, The Usual Suspects, Superman Returns) feels like a revelation. This is a big special-effects-laden movie that actually has someone in charge who knows what he's doing. Singer imbues the whole story with a lighthearted, sincere tone, never winking, never cynical. He just introduces us to Jack (Nicholas Hoult, from Warm Bodies and, as a kid, About a Boy) and Princess Isabelle (Eleanor Tomlinson) as children, hearing legends of giants and knights and daring adventures, and then lets them have their own. It's simple and basic and extremely well done. 4. All the plotpoints from the story show up—the beanstalk, the beans, the "Fee-fi-fo-fum"—but Singer doesn't play it for rib-nudging in-jokiness; he tells the story as if no one has ever told it before, as if he truly believed people needed to hear it. This has always been a strength of Singer's. Superman Returns might not work, exactly, but you can't deny it's not plainly, almost painfully, sincere. So it is with Jack the Giant Slayer. Casting someone like Ewan McGregor as the lead knight defending humans against the giants is a clue; McGregor is a big, open grin of an actor, incapable of smarm or irony or even self-protection. (The movie is also populated with terrific British actors, from Ian McShane to Eddie Marsan to a motion-captured Bill Nighy.) Singer wants to play this all straight, and because of that, it all works. 5. This is a movie for kids, to be certain, and I bet they'll respond to it. (Adults will enjoy it almost as much, if just by remembering what it was like before the real world crushed their sense of wonder.) It's all about adventure and escape and acts of derring-do that are said to have been out of fashion for decades but actually never will be. It's not a classic, and it's not anything we haven't seen before. But it's something we haven't seen much of in a long time. If this is the new baseline for kid's fantasy films, and not freaking Wrath of the Titans, we're in very good shape.